As much as we loved the painted look, we didn’t like the delays and we knew the readers didn’t either. 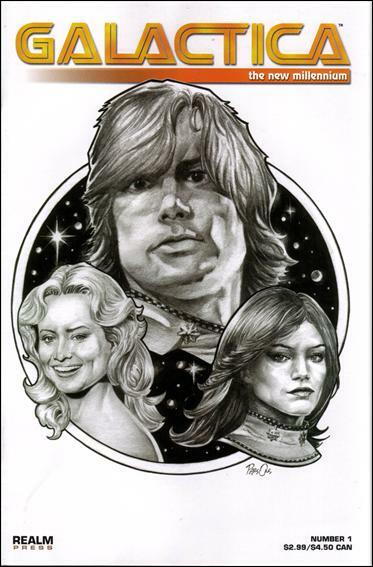 We were all fans of Walter Simonson’s issues of Battlestar Galactica that had been done at Marvel, too, so it was no big jump to decide that our second series would be done with traditional line art and that we’d also involve other creators. 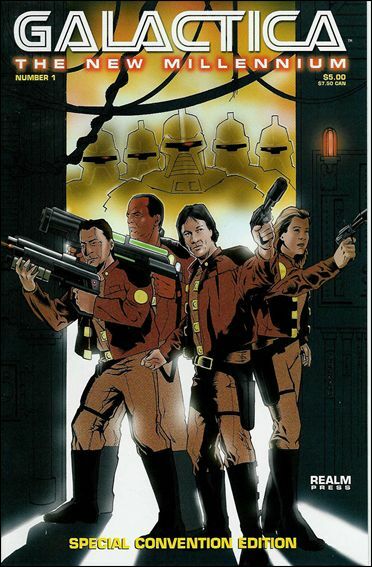 So was born Galactica: The New Millennium #1. 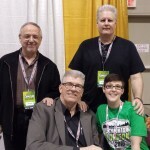 The first creator I contacted was Jim Shooter. JS was not working full time in comics at that point, but it had long been a dream of mine to work with him directly on something. Not only did he say yes right away, but he cut his rate tremendously just to help us out. The only real guideline I gave him was that we wanted to know what made Starbuck the way he was with relationships. The rest was up to him. He shot back a question or two, and then he was off to the races. While he was working on the script, I dropped him a line and told him how much I was looking forward to seeing the finished product. I even mentioned that he had rejected my first submission to Marvel when I was 13 to tell him that’s how long I’d wanted to work with him. “This isn’t some elaborate ruse so you can reject my script, is it?” he joked back. If only I had thought of that! The story was illustrated by Dan Parsons, a really good guy better known these days for his work on Star Wars at Dark Horse. Dan had knocked out a couple of amazing, highly rendered covers for us. You see flashes of that and the better art that would follow, though there’s a couple of clunky panels in there, too. That said, the finished version is still very enjoyable and something I look back on quite fondly. The second story in the issue was by comics historian and journalist Scott Braden (his only published comic work, I think) and artist Michael Malbrough. The third tale was by Jim Kuhoric and artist Santiago (superbly colored by artist David Hillman), noteworthy because Santiago is none other than DEFIANT alumni Joe James. A further trivia note: top-selling YA novelist Barry Lyga wrote a brilliant story, “The Care and Feeding of Your Daggit,” that was intended for the ill-fated second issue of the series. Also illustrated by Dan Parsons (a home run this time), it was later published in another Realm Press BG issue, but the title escapes me. If you’d like to check out what J.C. is up to post Mighty Samson, visit his blog. Back when this came out, variant covers were not a problem. Covers in general were just starting to become a problem. Today, I want to call them vagrant covers because they show up unexpectedly and just look like the publisher is begging for a little extra money. I actually prefer the regular version of this cover because something is actually happening. Today there is an abundance of the family portrait covers, the stare down covers, the flying like blue angels covers, the "look at me, my chest is poked out" covers. I REALLY miss the old days when a cover gave you insight about SOMETHING (anything) that was taking place in the comic itself. I actually miss word balloons that cover up the art and make you curious about how a plot device got resolved. These qualities all helped market the comics and make people think for half a second while scanning over a display of comics. That's part of what marketing is. Simple concepts like asymmetry can catch your eye and make you ponder buying for a few seconds longer. Sometimes that's all it takes. Thanks for posting the variant covers! 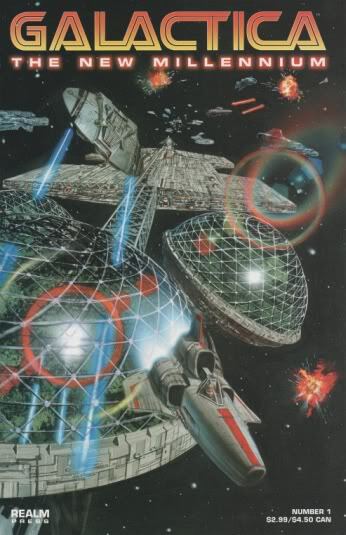 As a kid, I loved the look of Galactica even though I didn't enjoy the stories very much. (Maybe I was too young to fully get it.) The Robert Scott cover embodies the appeal of the show for me even though the Galactica itself isn't on it. I love the likenesses on Dan Parsons' cover! I hope the interior looks like this! I'll find out when I get my copy of this issue next week. I didn't know Gene Gonzales had done a cover for a comic of Jim's as far back as 1999. I'd love to see his art in Seven #2. His cover intrigues me. Was #2 completed? I can't even find #1. I found jpgs of the other two covers and sent them to JayJay. One is by Dan Parsons and is Starbuck-centric for Jim's story. The other is by my frequent collaborator Gene Gonzales. Both are pretty cool. The first image was by Robert Scott, who really got those ships, in my opinion. I think a few of us online came to the conclusion that a variant cover was also published for this issue. I bought at least 3 of any small indy comic back then. Ordering 1 copy of something is almost a certain guarantee that the comic will arrive damaged. Ordering 3 of something means the middle copy might not even get touched. I know I still have a couple of these and maybe 1 or 2 more. I had high hopes back then that Jim would produce more work for Realm Comics. I do believe the overall quality of the product met my expectations. I wish I could say that about comics today. Thanks for explaining how Jim came to write for Galactica: The New Millennium. I'm glad you instructed Jim to write about the psychological underpinnings of Starbuck. I've only seen the original Galactica a couple of times since the 70s, so I barely remember him. But Jim's script reintroduced me to him. Even got me to care about him. So much in eight pages. I'm not a Galactica fan, but I'm going to recommend it as a model for writing. Coincidentally, my copy of New Millennium. just shipped today along with Mighty Samson #2-3. Can't wait to reread "Fear of Flying" with pictures – and see Joe James' art in a different context. Were you trying to imitate Jim when you submitted to Marvel at 13? What would JayJay have contributed to the other Galactica project? Was she going to write? Color? Maybe even draw? I assume she wrote the note at the bottom of your post. I didn't know you had your own blog! I hope to see you here again, either as a guest blogger or as a commenter! Members of the Shooter "family" of creators are always welcome in my book.